We end the year with news of a new shyshark, Haploblepharus kistnasamyi, from South Africa that has been described by shark researchers Brett Human and Leonard Compagno and named after Nat Kistnasamy from the Oceanographic Research Institute in Durban. It was known as the KZN form of the puffadder shyshark, Haploblepharus edwardsii. In the Coastal Fishes of southern Africa this shark is referred to in the species account of Haploblepharus edwardsii where it says a similar species with dark brown saddles and irregular pale spots represents an undescribed species. The holotype of this KZN shyshark is from Landers Reef and was collected by Phil Heemstra. It is known from Umvoti south to Plettenberg Bay to depths of 30 m. Specimens from the Eastern Cape are mainly juveniles. The 427 mm TL holotype of the endemic shyshark Haploblepharus kistnasamyi from Landers Reef. Allen Walker sent us an exciting new record for Africa, the twospot turkeyfish, Dendrochirus biocellatus . He photographed it in October 2006 at Waynes World, Ponta do Oura, southern Mozambique, at a depth of 23 m. This identification was confirmed by Stu Poss the scorpionfish expert. The twospot turkeyfish is named for the two dark eyespots (ocelli) ringed with white which are found on the soft rays at the rear of the dorsal fin. However it is not all that unusual to find fish with three eyespots. It also has feeler-like tentacles in front of the mouth. The distribution is Indo-Pacific: apparently this secretive species is seldom photographed and has only been reported from the islands of Mauritius, Maldives, Réunion and Sri Lanka in the western Indian Ocean (WIO). Species of Dendrochirus are closely related to the firefishes, Pterois. A difference between them that you might be able to see underwater is that Dendrochirus have branched upper pectoral fin-rays while those of Pterois are unbranched. 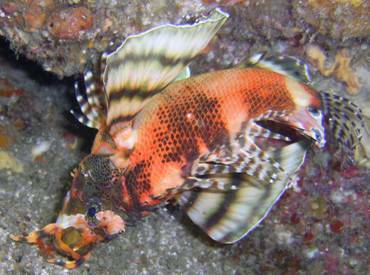 The twospot turkeyfish, Dendrochirus biocellatus from Ponta do Oura. Look at the soft (rear) part of the dorsal fin to see the eyespots (ocelli), also notice the tentacles by the mouth. Photograph by Allen Walker.